Shivani Shivaji Roy, a dedicated and brave police officer with Mumbai Police, chases a Delhi-based kingpin, Karan Rastogi, who runs an organized crime cartel involving child trafficking and drugs. Her aim is to hunt him down and rescue a young teen girl, Pyari. She takes the task more personally and goes beyond her legal rights and duties to achieve her aim as she's very close to the girl she wants to rescue. Karan, aware that Shivani is continually monitoring his cartel's activities, gets in touch with her on phone, suggesting her not to interrupt his business. Shivani is determined to catch him. Using intelligence inputs, she tracks down his associate in Mumbai, who leads her on to the Karan's close aide Wakeel, in Delhi. In a gruesome and brutal incident, Karan dismembers one of Pyari's fingers and sends it to Shivani's house wrapped in box as a gift. He also gets Shivani's husband abused and thrashed. Shivani travels to Delhi and sets up a trap involving decoy drug dealers from Nigeria, who pretend to offer very expensive rare South American cocaine to Karan and Wakeel. When the decoy drug dealers are negotiating the deal with Wakeel, Shivani with other police officers, barges in. While Karan manages to escape, Wakeel finds himself in a situation where he senses he would definitely get arrested. He figures that if he gets arrested, the police would interrogate him, leading to Karan's arrest. He, therefore, tries to destroy evidence by destroying his mobile phone's SIM card and then shoots himself. Shivani's continued investigation and the information from her sources leads her to Karan's house, where Karan's mother sediates her. She is abducted and brought to a party organized by Karan. She meets Pyaari at the party, where Pyari and other young girls are forced to work as prostitutes. Shivani single handedly confronts the situation and forces Karan to an enclosed space, also rescuing and taking those girls with her. She challenges Karan to fight her, where she hits him badly. Sensing that Karan might escape the law, given the corruption in policing and judicial system, she hands over Karan to the girls, who beat him to death. His other gang members are arrested and prosecuted. More details of Mardaani on wikipedia. Original Mardaani Blu-ray released by Yashraj comes in 1 disk Blu-ray pack. Blu-ray having 3 Subtitle. While processing the order, we bubble wrap the Blu-ray in its original packing and send it in sealed plastic or carton pack. 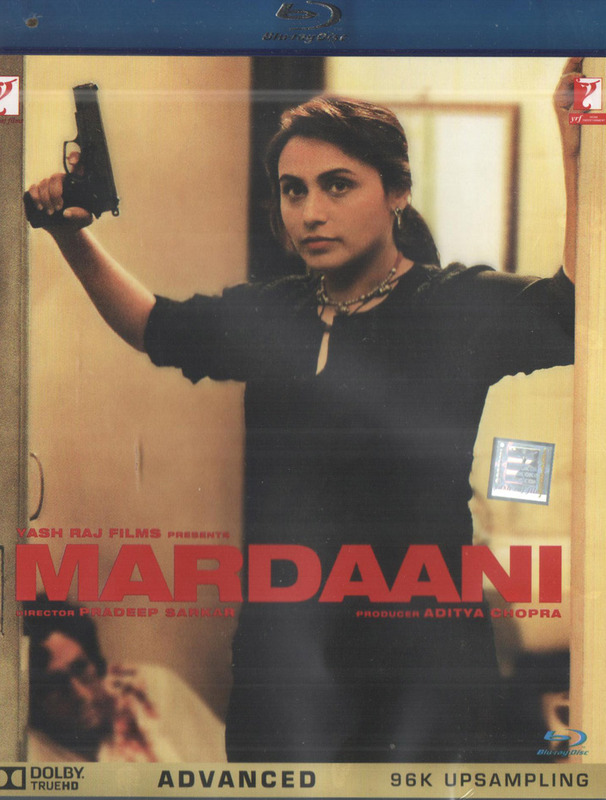 We don't offer download of the Movie Mardaani, nor we send free poster of the Movie along with its Blu-ray order. We also don't offer free wallpaper or song download of the Movie. Poster and other accessories of the Movie can be purchased separately. Buy Hindi Blu-ray Mardaani and watch them at the comfort Of your own home. Online shopping Mardaani Blu-ray, Buy Mardaani Blu-ray, purchase original Hindi Blu-ray of Mardaani. 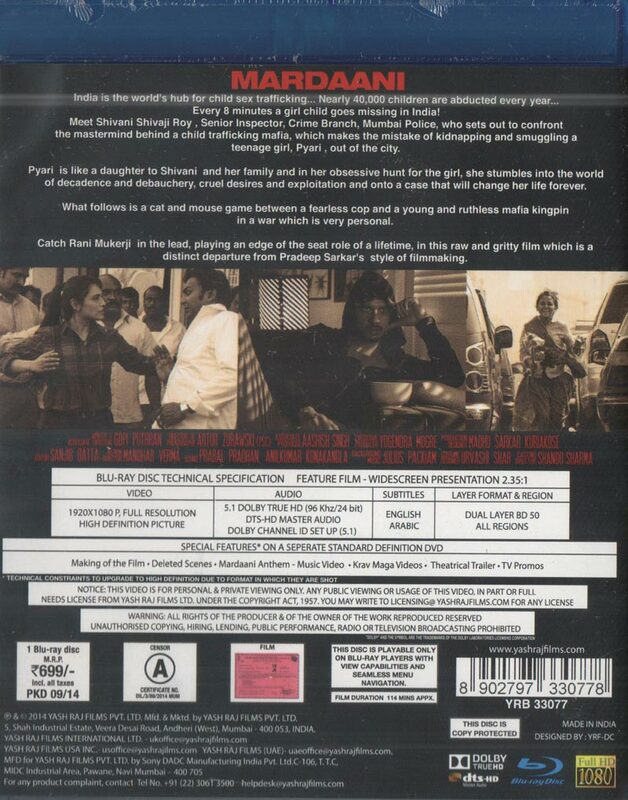 Online store to buy Mardaani Blu-ray	, online Blu-ray store india, buy Hindi Blu-ray, watch Hindi movie Mardaani videos online. We don't offer Blu-ray renting for Hindi movies online, Buy Original Mardaani Blu-ray @ discounted and cheapest price online in India.